I love pancakes, but they can be one of those 'hit and miss' recipes for me. I think the Gods have to be smiling on me, or the planets need to be aligned for them to be 'just right'. 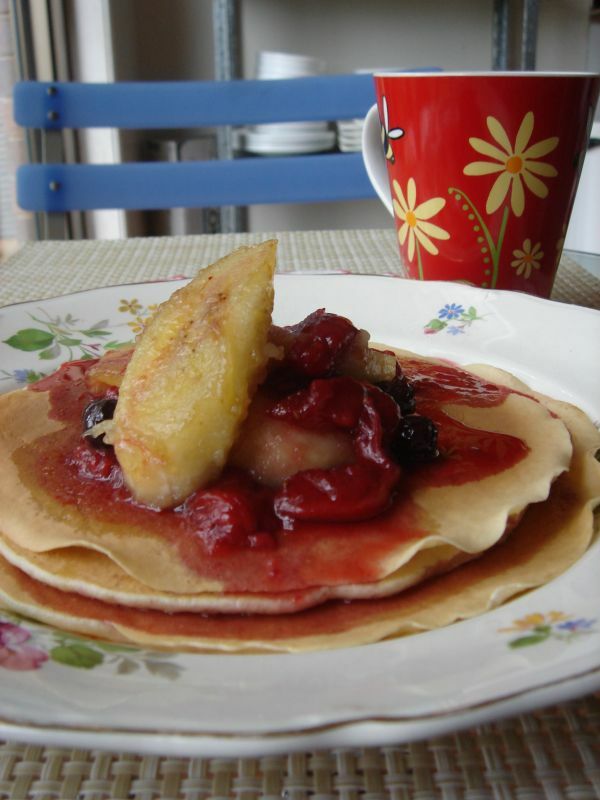 Whenever I make them, I know I will end up with either a light, fluffy pancake or a thick, dense, cakey one. I guess I need more practice. 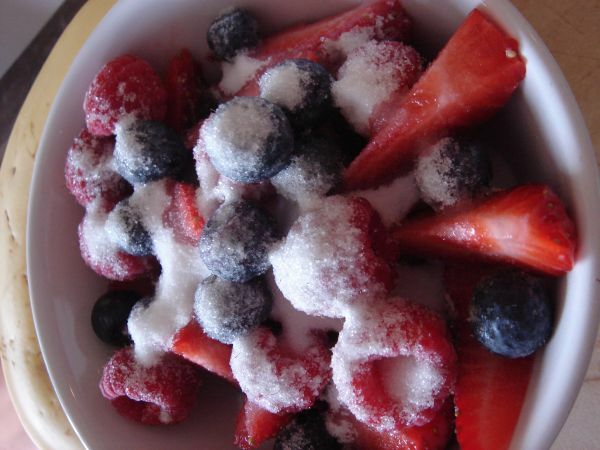 Put dry ingredients into a bowl. Add milk and egg and whisk to combine and break up the lumps. The batter should be about the consistency of pouring cream (or just a tad thicker). 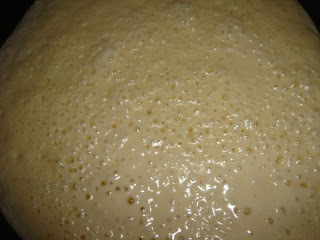 Let the batter sit for 30 mins (or even overnight in the fridge if possible). Grease a non-stick frypan with a little butter (I like to wipe it with paper towel to remove any excess that may burn in the pan) and have your pan moderately hot. 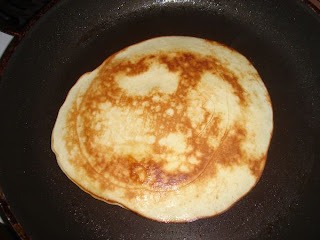 Ladle in about 1/4 cup of batter and swirl your pan to spread it out to your desired size/shape/thickness. Watch the surface of your pancake, when the bubbles rise to the surface of the batter, it is ready to flip. Cook on the flip side for about a minute. (You will get a feel for how long they need to cook for). I love my pancakes with fruit, so here are two of my favourite sweet additions. This is so simple. 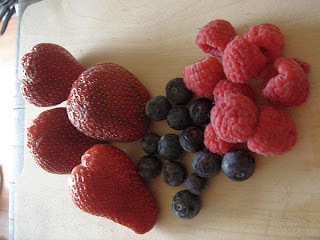 Take a few berries - here I have used strawberries, frozen raspberries and frozen blueberries and put into a bowl. Sprinkle over 1 tbs of sugar and a few drops of vanilla extract. 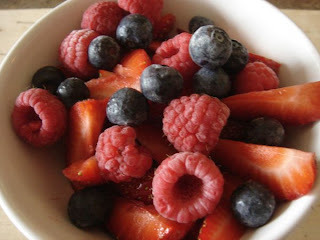 Place bowl in microwave and cook for 1-2 minutes. 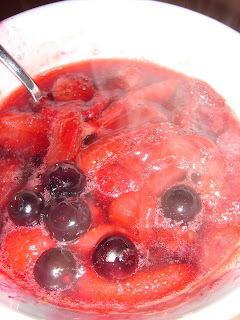 The berries will collapse and release their juices and the sugar sweetens the syrup. The longer you cook the syrup the more it will reduce and the pectin in the fruit will help create a 'jam' like consistency. Heat a non-stick frypan and add 1 tbs of butter. 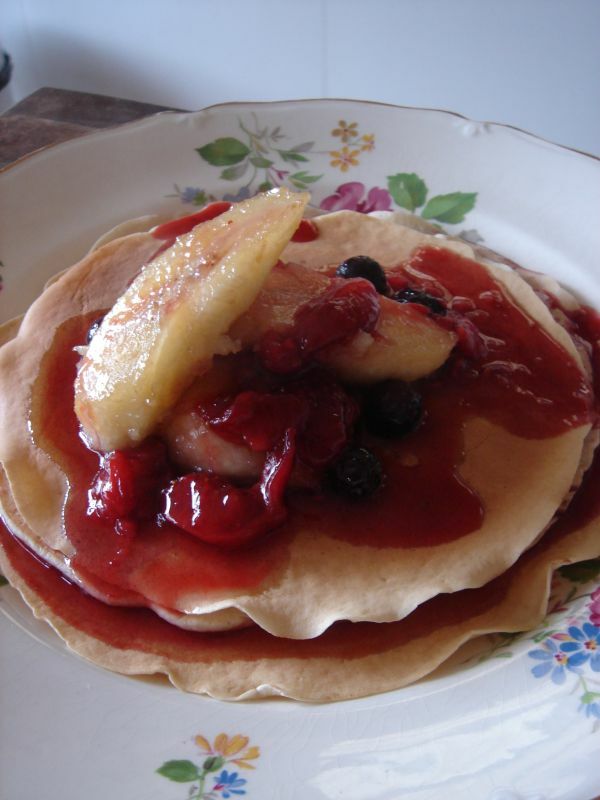 Add 1 sliced banana and cook until the banana takes on a little colour and softens slightly. Add 1 tbs of Maple Syrup. 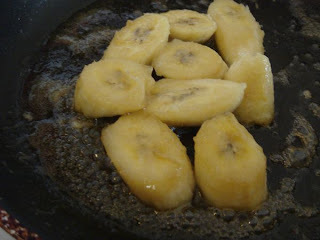 The syrup will mix with the butter to caramelise and to give the bananas a lovely glaze.